The Weatherhawk padded carrying cases offer easy accessibility and protection for your WeatherHawk wind meter. The Velcro covering flap is secure, yet easily opened for immediate access. The rear, Velcro secured belt loop is wide and long, to accommodate a wide range of straps, belts and other loop configured mounting locations on field vests and jackets. 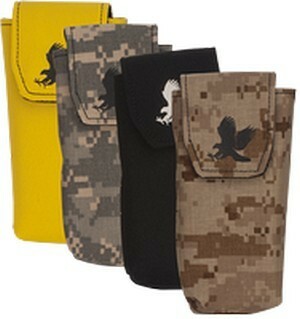 These pouches are available in black, yellow, jungle camo and desert camo.